Canadian medical marijuana will ultimately be available in most of Germany’s 20,200 pharmacies, thanks to two notable deals reached this week by major licensed MMJ producers. The agreements – involving Cronos Group and Tilray – will put tens of millions of dollars worth of Canadian MMJ within reach of Germany’s 70 million insured people. Product could be available in pharmacies as soon as next week. The two agreements underscore the determination among Canadian medical marijuana producers to aggressively expand into Germany, which is Europe’s largest pharmaceutical market. The Cronos and Tilray deals are among the most ambitious to date. On Thursday, Ontario-based Cronos announced it inked an agreement that gives its Peace Naturals-branded cannabis flower access to potentially 12,000 pharmacies across Germany. The company’s shipments will reach a total of 2,000-4,000 kilograms next year, an amount that carries a potential value of some 36 million Canadian dollars ($30 million), according to Cronos. On Tuesday, British Columbia-based Tilray struck a partnership with a leading German pharmaceutical wholesaler to gain access to its network of 16,000 pharmacies. Tilray’s first shipment of MMJ extract products already has arrived in Germany. The company declined to disclose the revenue figure for the deal. 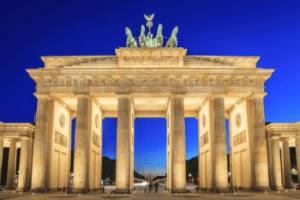 The deals allow both companies to tap Germany’s nascent but potentially large MMJ market – one that many analysts say has explosive growth potential given that the country doesn’t yet have any domestic medical cannabis producers. “We’ve been steadily increasing the size of our cannabis exports to Germany for a year and we still haven’t scratched the surface of meeting the demand,” said Mike Gorenstein, president and CEO of Toronto-based Cronos Group. Cronos and Tilray for now will rely on exports from Canadian production facilities. Both, however, ultimately plan to serve the German market – and the rest of Europe – from new cultivation facilities they are building overseas. In September, Cronos unveiled plans to build a massive facility in Israel. Two days later, Tilray promised to spend 20 million euros ($24 million) to build a medical marijuana production facility in Portugal. The German medical marijuana market is a ripe one for Canadian producers. Earlier this year, Germany became the largest federally legal medical marijuana market in the world. Every German citizen is mandated to have health coverage through a private company via the country’s statutory health insurance (SHI) system. Several large insurance firms offer MMJ in their coverage plans. All 70 million SHI-insured people can freely shop around for a medical plan that suits their needs, which may include medical marijuana. Germany has the second-largest health insurance market in the world, one valued at 213 billion euros ($252 billion). Medical cannabis is now accessible to the country’s 70 million insured people. Germany isn’t expected to have sufficient domestic supply for years. The country is currently conducting an application process to select 10 German-based licensed producers to cultivate 200 kilograms (441 pounds) of medical marijuana annually from 2019 to 2022. Until then, the market will be filled through imports, and the list of Canadian companies lining up to supply Germany is growing by the month. Alberta-based Aurora Cannabis (TSE: ACB), which earlier this year acquired Germany-based Pedanios, an importer, exporter and distributor of medical cannabis. Canopy Growth (TSE: WEED), which acquired MedCann, a Germany-based pharmaceutical distributor, in late 2016. Cronos struck an exclusive five-year distribution deal with Pohl-Boskamp, a privately-owned German pharmaceutical business, and will ship a minimum of 2,000-4,000 kilograms of flower next year from Canada. Pohl-Boskamp plans to distribute Peace Naturals-branded cannabis flower alongside its own products in up to 12,000 pharmacies across Germany. Cronos said it will be the first time medical cannabis will be available in German pharmacies in leaf form countrywide. Once Cronos’ Israeli production facility comes online in phases starting next year, the company expects to start filling German demand from there. “Canadian patients will be the long-term priority for the Canadian supply, but we want to help patients in Germany as well. Israel is much more of an export-focused production platform,” said Gorenstein. Tilray stuck its deal with NOWEDA, essentially a large German co-op owned by 9,000 pharmacists. NOWEDA’s network of 16,000 pharmacies gives the Canadian licensed producer access to about 70% of Germany’s pharmacy market. Tilray’s first shipment of extracts – 3,000 25-milliliter bottles – will be available in German pharmacies next week, marking the first time cannabis extracts were shipped there for national distribution, according to the company. The second order – more than double the size of the first – is already being prepared “in anticipation of growing demand. There’s massive demand in Germany for medical cannabis products,” Brendan Kennedy, CEO of B.C.-based Tilray, told Marijuana Business Daily from Germany. Tilray plans to expand its product offering there to more than a dozen products over the next six months. does Tilray plan to go public anytime soon? Two takeaways. Why can’t Germany grow their own…are they incompetent or have high overhead? And does our Congress feel like idiots losing all this business to Canada? Very interesting information, keep up the good work. stock price was $ 0.30 cents per share. Do you have new information.